Snapchat added a new Bob Marley lens for 4/20 that has sparked outrage online. Snapchat thought it had found a way to have a little fun on Wednesday, April 20, with a Bob Marley themed graphic. But the company went a little too far, according to irate users online. To acknowledge 4/20, known as "Weed Day," Snapchat created a special "lens" that morphed people's faces into Bob Marley, the late reggae icon. The lens added dreadlocks, a crochet slouch cap, changed the shape of eyes and noses, and darkened skin color. People flooded Twitter with accusations that Snapchat had created a blackface filter. Someone at Snapchat: "So, how do we *scale* blackface?" So @Snapchat, every single "pretty" filter is designed to make us look White and now you're doing Blackface with a Bob Marley filter?? Snapchat hasn't addressed the controversy and said in a statement to CNNMoney that the lens was built "in partnership with the Bob Marley Estate." "Millions of Snapchatters have enjoyed Bob Marley's music, and we respect his life and achievements," Snapchat says. "[The lens] gives people a new way to share their appreciation for Bob Marley and his music." Lenses have become a popular way for people to alter their photos when using Snapchat. The technology scans selfies and can change specific aspects of the face to produce weird and interesting images like rainbows cascading from people's mouths. Selfie-altering apps like Face Swap have also grown in popularity in recent months. Facebook has even acquired a similar app called MSQRD, which lets people transform themselves into different animals and cartoon characters. 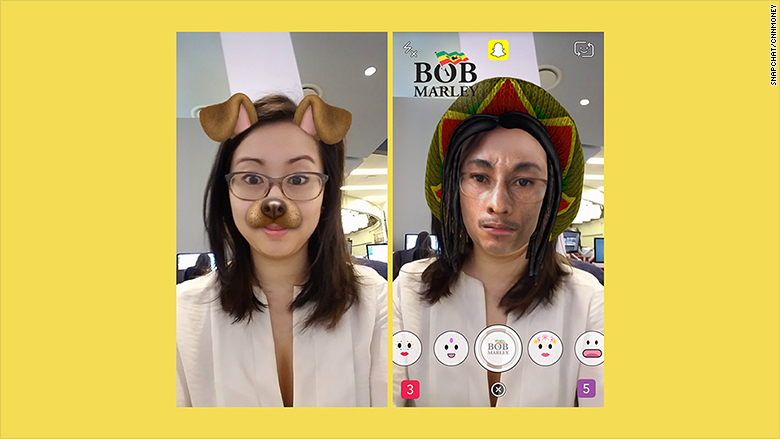 MSQRD has a Bob Marley filter too, but the app is not as popular as Snapchat, and the app places photos onto people's faces like a mask, which is a little less creepy than what Snapchat has been able to do.